Bio: Karl Addison has been exploring the idea of over-population, saturation, and the dynamics between individual identity versus the selfhood gained and lost, when one becomes part of a union. 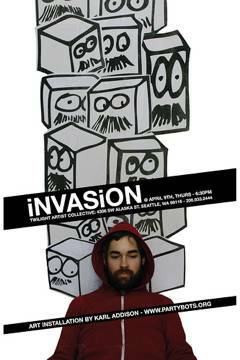 For this show, Karl will impregnate the back gallery of twilight with a superplethera of mustachio boxes. The mustachio boxes, each having individual personalities, that when view together in this overpopulation become something all together different. An ardent naturalist, Karl Addison uses earth friendly products in all his endeavors.